Monetary policy around the world has taken an unprecedented turn—with negative interest rates now the norm in several parts of the world. Brooks Ritchey, Senior Managing Director of K2 Advisors, sees scant evidence to prove this policy approach is working to stimulate economic growth. He also explores what the policy wonks and political theorists have to say about the subject, and why he thinks there could be unintended (negative) consequences from a negative-rate policy. Central banks around the world have been gaining comfort with and embracing the concept of zero-interest-rate policies (ZIRPs) and negative-interest-rate policies (NIRPs) for some time. 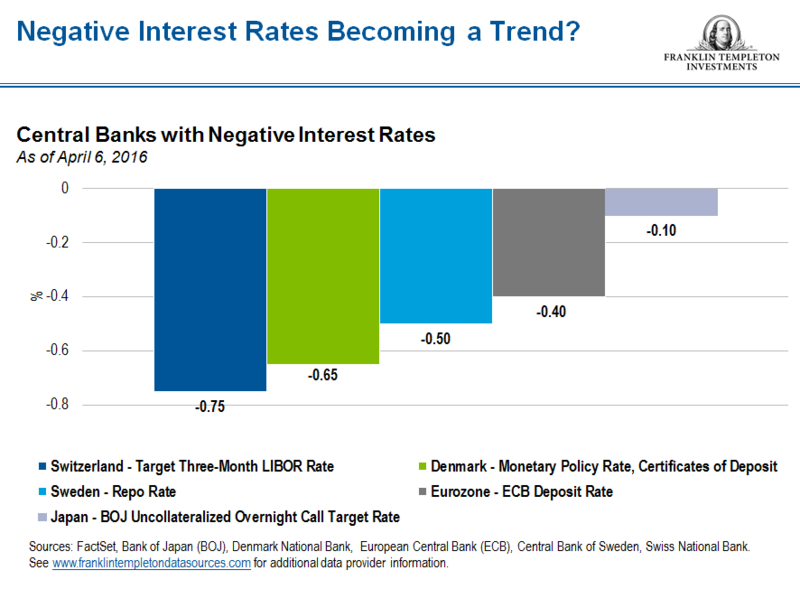 Despite unknown and perhaps significant unintended long-term consequences, the European Central Bank, the Bank of Japan, and the central banks of Sweden, Switzerland and Denmark have all moved interest rates into negative territory. Bear in mind, negative interest rates are for all intents and purposes a mandate that will implicitly weaken sovereign banks. They are a contrarian command to what is seemingly rational and natural in the world of normally functioning markets. In essence, the banks are being told to go out and make as many loans as they can—even if they are potentially bad ones. Just keep lending the cash and forget about any risk compensation for doing so. There are countless examples in history, some more hubristic than others, in which man’s efforts to address a problem or control a system have resulted in miserable failure―regardless of best-laid plans. One example is how US policies implemented at the turn of the 20th century aimed at mitigating fire damage within the country’s vast national forests were instead likely responsible for making today’s fires much worse. Prior to 1890, fires in the American Southwest burned every five to 10 years on average and were mainly small fires that consumed grass, shrubs and seedlings; the big Ponderosa pine and Douglas fir trees were largely unscathed. The fuel sources that contributed to larger fires were thinned and the integrity of the overall ecosystem was protected. That was the norm until a series of particularly devastating fires (called “The Big Blowup”) led the US Forest Service to direct its energies to suppressing fires at all costs. While its efforts proved highly successful, in hindsight many people concluded that the longer-term consequences of the policy likely negated short-term benefits. Absent periodic small blazes—which as a matter of course were regularly extinguished—these regions became major habitats for massive free-burning wildfires. Today the mountains of New Mexico, Arizona, Colorado and Utah are choked with grass, shrubs and trees of all sizes. The undergrowth is now exceptionally thick, and as such it ignites more easily and fuels much larger and more devastating conflagrations. Today’s fires are burning bigger and hotter, and are not only damaging forests but are wiping them out. In 2012 alone, more than 75,000 wildfires burned some 9 million acres in the United States, a disturbing statistic.1 In short, the behavior of fires in the western United States in recent years has become unprecedented and unpredictable, and certainly not something US Forest Service policymakers could have envisioned 75 years ago. Similarly, as central banks globally continue to use aggressive monetary tools like NIRP to smother the deflationary flames left behind in the wake of the 2008-2009 global financial crisis, could it also be that their efforts are inadvertently incubating a much greater and more severe economic catastrophe down the road? We presume that the policymakers and academics at the central banks are fully aware of the potential for negative outcomes; nonetheless, they are compelled to press on. As I see it, the majority of central bankers today are from the Keynesian school of economic thought (based on the theories and principles of British economist John Maynard Keynes), the prevailing orthodoxy taught in most universities over the last century. As Keynesians, they are vehemently opposed to the possibility of deflation in any form and believe all measures should be implemented to prevent it. Hence, they are compelled to push forward with easy monetary policy programs regardless of the lack of any evidence that would point to their efficacy. Of note, not everyone agrees with the path central banks have embarked on since the financial crisis, and indeed there have been some notable dissenters. Essentially the arguments for and against monetary easing can be distilled down to two distinct schools of thought: the aforementioned Keynesian school (representing the prevailing ideology driving decision-making in most developed market central bank board rooms today) and Austrian economics. Austrian theory is based on the ideas of a collection of academics, some of whom were originally citizens of Austria-Hungary, including Ludwig von Mises. In the simplest of terms, Keynesians argue that private-sector business decisions may sometimes lead to inefficient outcomes, and therefore government intervention is occasionally needed to step in with active monetary policy actions. These actions may be coordinated around a central bank. Generally, the Keynesian view believes that spending is what drives economic growth, and deficit spending in a recession can be offset via fiscal surpluses in an expansion. Austrian theory argues for very limited government intervention in the economy, particularly in the area of money production. The Austrian school believes that central bank manipulation of economic cycles with artificial stimuli does more long-term harm than good, ultimately creating bubbles and recessions that are far worse than would be experienced in a natural economic cycle. To summarize, the Austrian school suggests markets are self-correcting mechanisms that follow fairly smooth cycles, and it is better to let nature run its course (so to speak) as opposed to intervening when things may be less than optimal (e.g., recession). Keynesians believe economic cycles can be smoothed with tactical government monetary intervention, and that fiscal policy may be modified occasionally to better guide market cycles. So which view is correct? Is it better to ease aggressively―and then ease some more when things still haven’t improved—or should central banks simply remain on the sidelines and let the markets sort themselves out on their own? We do not live in an “either/or” world, and the optimal application of economic theory—in my humble opinion―probably lies somewhere in the middle. The problem is that we have long since moved away from the middle, and in dramatic fashion with the introduction of NIRP programs. The balance has decidedly tilted to one side. I have serious concerns as to what the potential longer-term unintended consequences of easy monetary policy could be. Austrian economic theory is highly relevant to this issue, as the focus is on the cumulative effects of bank-related credit on supply-side economics. Austrian economists believe that savings are what grow an economy, as those savings can be utilized by others to borrow and grow businesses, as opposed to money borrowed on credit from a central bank. If there are more savers, money will be cheap to borrow (low interest rates) as the supply is greater than demand. If the pool of savers is less than the demand, however, interest rates will naturally rise, enticing the market to save more and borrow less. Theoretically, the result will be economic equilibrium, with an economy that may not grow rapidly in the short run, but will be more stable and sustaining in the long run. So from an Austrian perspective, credit created by the banking system―as opposed to credit that is the result of genuine savings―may spur spending in the short run but also creates misallocations of real resources (so called “malinvestments”) in the long run. These malinvestments often yield returns that are inadequate to service the debts associated with their purchase. If additional loans are primarily used for productive investing, thereby creating a future extra income source for repaying debts later, then things should work out. However, as has been the case in Europe and the United States for much of the past several decades, it feels like an ever-smaller proportion of debt is used for investments, while an ever-larger proportion is used for extra consumption, imports and buying houses. This type of spending does not generally create future revenue, and so interest and repayment obligations have therefore come to absorb an increasing proportion of individual incomes over the course of time—despite the fact that interest rates have been in a downtrend since 1980. In my view, this is a troubling development. From an Austrian view, the primary reason we are in this position of yet again attempting to jump-start growth via massive liquidity is because of—massive liquidity! So the question remains: Has the trend toward credit accumulation over the past 75 years at long last reached its limit? At the end of the day, if we take Wall Street, global financial centers and banks out of the picture, we think it is fair to say that neither Europe nor Japan nor the United States for that matter have seen much of a significant economic recovery post-2008. Japan is still dealing with severe deflationary pressures, Europe looks to be teetering on the brink of recession again, and growth in the United States hasn’t been as robust as hoped for. Meanwhile, policymakers are doubling down on their strategy. As of the third-quarter 2015, trade growth in the United States is down 1% from peak export volumes, the EU is down 2% (exports globally not intra-EU), Japan is down 3%, and China/Hong Kong are off 5%.4These numbers may not seem exceptionally large, but I think it is unusual to see a coordinated decline in export volumes, particularly when it is shared by every major economy on Earth. When global trade volumes contract, the domestic political pressure to circle the monetary wagons (depreciate currency) and grab a larger slice of the ever-shrinking trade pie become even more paramount. This was evident in the 1930s with protectionist policies and tariffs and quotas, and it is evident today in the form of negative interest rates. It has become clear to me that what the central banks have done with monetary tools has, to date, outside of staving off a systemic collapse of the financial system, done very little in the way of stimulating organic economic growth. As such, I have a hard time believing that a major NIRP campaign will help stave off deflation either. Pack your bags, but don’t forget the fire extinguishers! 1. Source: US National Interagency Fire Center. 2. Source: World Trade Organization, September 2015. There is no assurance that any estimate or forecast will be realized.